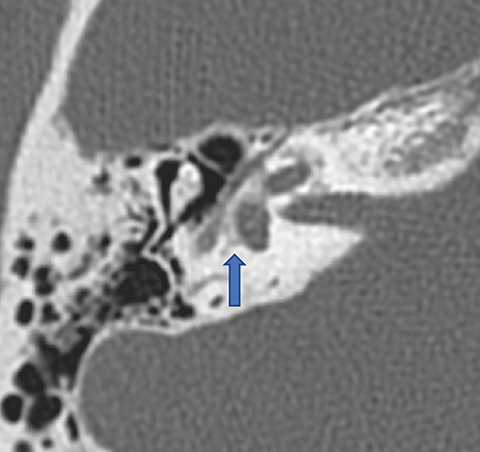 A 57-year-old female presented with a longstanding history of left-sided hearing loss that progressively worsened over the previous year with intermittent otalgia and superimposed subjective non-pulsatile tinnitus. Audiologic evaluation was notable for mixed conductive and sensorineural hearing loss on the left. Temporal bone CT imaging demonstrated resorptive changes along the margins of the oval window and cochlear promontory on the left with capsular sparing on the right compatible with clinically suspected fenestral otosclerosis. Due to the low-level gap in air/bone conduction at diagnosis, the patient was not deemed a surgical candidate for stapes replacement and referral was made for fitting of external audiological aid. 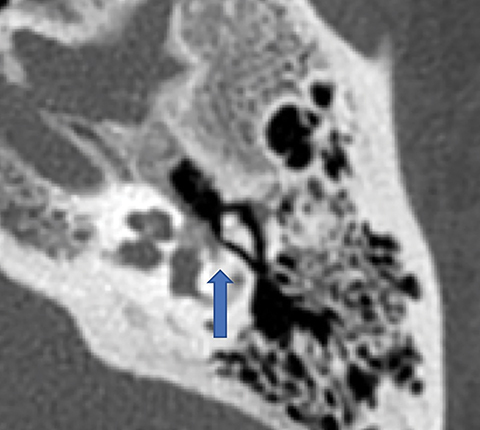 Temporal bone noncontrast CT imaging demonstrated resorptive changes along the cochlear promontory of the left otic capsule (Figures 1-3). This pathology lies in the area of the left fissula ante fenestram, which is consistent with fenestral otosclerosis. The contralateral otic capsule demonstrates the normal dense appearance of endochondral bone. In summary, HRCT imaging of the temporal bone plays an ever-broadening role not only in the initial diagnosis of otosclerosis, but also in treatment planning. Manifesting initially in the so-called fenestral phase with resorptive changes at the level of the oval window, otosclerosis progresses over time to involve the cochlear promontory and otic capsule. Sclerotic overgrowth may be seen with more advanced cases, commonly resulting in narrowing of the oval window and fixation of the stapes footplate. Clinically, patients initially present with conductive hearing loss. This progresses to mixed sensorineural hearing loss as the otic capsule is increasingly affected. Advanced disease findings on HRCT have been shown to correlate independently with both surgical treatment failure and increased rates of postoperative complications. Rudic M, Keogh I, Wagner R, et al. The pathophysiology of otosclerosis: Review of current research. Hear Res. 2015;330(Pt A):51-56. Whetstone J, Nguyen A, Nguyen-Huynh A, et al. 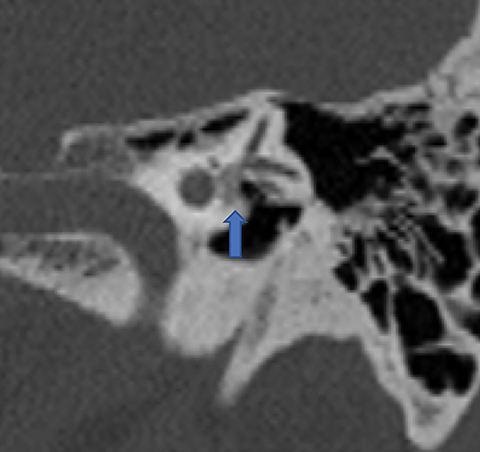 Surgical and clinical confirmation of temporal bone CT findings in patients with otosclerosis with failed stapes surgery. AJNR. 2014; 35: 1195-1201. Purohit B, Hermans R, Op de beeck K. Imaging in otosclerosis: A pictorial review. Insights Imaging. 2014;5(2):245-252. Virk J, Singh A, Lingam R. The role of imaging in the diagnosis and management of otosclerosis. Otology and Neurotology. 2013; 34: e55-60. Lagleyre S, Sorrentino T, Calmels M, et al. Reliability of high-resolution CT scan in diagnosis of otosclerosis. Otology and Neurotology. 2009; 30: 1152-1159. Yamashita K, Yoshiura T, Hiwatashi A, et al. The radiological diagnosis of fenestral otosclerosis: the utility of histogram analysis using multidector row CT. Eur Arch Otorhinolaryngol. 2014; 271: 3277-3282. Mori N, Toyama Y, Kimura N, et al. Detection of small fenestral otosclerotic lesions by high-resolution computed tomography using multiplanar reconstruction. Auris Nasus Larynx. 2013; 40: 36-40. Lee TC, Aviv RI, Chen JM et-al. CT grading of otosclerosis. AJNR. 2009;30 (7):1435-1439. Cureoglu S, Baylan MY, Paparella MM. Cochlear otosclerosis. Curr Opin Otolaryngol Head Neck Surg. 2010;18(5):357-362. Burmeister J, Rathgeb S, Herzog J. Cochlear implantation in patients with otosclerosis of the otic capsule. Am J Otolaryngol. 2017;38(5):556-559. Lin T, Rheinboldt M. Fenestral otosclerosis. Appl Radiol. 2018;47(11):37-39. Prepared by Tayson Lin while an MSIII Student at Wayne State School of Medicine, Detroit, MI , and Dr. Rheinboldt while a Radiologist in the divisions of neuroradiology and emergency radiology, Henry Ford Hospital, Detroit, MI.